Howling Wolf Weisse Bier | Grand Teton Brewing Co.
A: Hazy, pale golden color with over one finger of soft white foam head. Light lacing remains on the glass. S: Rich, yeasty bread is complemented by fresh lemons and appropriate phenolics of clove and banana. All of the sensory qualities present here marry well together, presenting a smell that is traditional but also elevated. T: Begins off-dry, initially tart with little follow-through as flavors become more dry by the middle. Occasional bursts of slightly metallic medicinal flavors are detected. Yeast, cloves, and some earthy hops emerge in the middle, showing off restrained bitterness of short duration that does not persist into the crackery and slightly herbaceous finish. M: Thin viscosity, wet on the palate without coating it, with low carbonation. D: This well-crafted American hefeweizen features an impressive smell but struggles to follow up with equally assertive flavors or texture. The taste is best after the initial hollow burst of tart acidity, but some questionable flavors remain labile on the palate. Its overall lack of body is unmemorable, failing to smoothly coat the palate as a proper wheat beer should. It is not the equal of Sierra Nevada Kellerweis, but it could give some of the second-tier German brands a run for their money. Pours a murky gold with a thin white cap. Allows some lacing to stick to the glass and the head barely hold up. Banana, clove, yeast and detergent powder. Some dark fruit notes, biscuit malt and solvent alcohol/plastic off tones. Wheat provides a slight zip to a corn meal and musty card board malt profile. Banana, clove and orange peel. Very heavy handed on the fruit notes. Malt lays flat on the tongue without any cleansing or activity. Medium body provided by the yeast yet remains overly carbonated, hyperactive bubbles cloud the flavor. This beer doesn't possess any drying capability and overall feel of this beer is flat and bland. Really an all over the place beer, active carbonation yet the malt doesn't brighten this beer and the banana and orange fruit notes stray to the darker end of the spectrum. Rather artificial and hardly refreshing. A: Pours a hazy, light grain colored ale. Despite saying the beer is hazy, it has excellent clarity. No head formation on pour, but can be agitated with stirring. However, this is almost immediately transient. No lacing. S: Grain,lemon rind, bavarian yeast, hints of soil. The slightest feel of coriander and pepper. Pleasant. At the far end, there is a hint of rubber (not cool). T: Wheat, corn meal, yeasty, sweet. Slightly acidic with citrus tones. Salt water taffy tone. M: Medium body with medium carbonation. Slicks the palate and sticks around. D: The beer is okay. Not the most drinkable of their offerings, and unfortunate given this is one of my favorite locals. This beer as a weizenbock exceeds expectations, this does not though. I had the fancy 22 oz. bottle with the ceramic cap and it was completely flat. Here I am reviewing the 12 oz. bottle and it was OK.
A: Pours hazy gold under a 2” frothy white foam collar that grips the side of the glass. S: Light fruit, a hint of banana, very minimal clove, whitwe bread. T: Yeast driven. Has a rich yeasty malty sweetness with light fruit. The banana flavors are medium light and the clove flavors are light. F: Creamy, medium full body, medium high carbonation. O: This is an easy to drink hefeweizen. Those looking for big banana and clove flavors might want to look elsewhere. A: Pours a very cloudy yellow/golden. It had a small head that went away quickly in about half a minute. S: The smell is very fruity with some wheat detected. The fruitiness mostly consisted of bananas. T: The taste is sweet, but not overbearing. It is mostly fruity and with a strong taste of bananas. M: There is a slight tingle in the feel and goes down very smoothly. D: This beer is a great example of a hefeweizen. I'd definitely purchase this again. O- Very tasty and palatable. One of the nest wheat beers I've had in a while, nothing offencive about it, if it is a little uninspired at times. Poured from bottle to pokal: Hazy golden pear with a wispy white head that fades out to a nice ring. The nose is very yeasty, crisp, sweet banana bread. Fresh smelling. I wish this bottle was fresher, but I can still get a good sense of what it once was - banana, clove, a little bubble gum. Easy drinking. Mirky but not too mirky (unfiltered) pale golden straw color with a 1-2 cm bubbly white head. Low retention and lacing. Nice sweet banana notes on the nose immediately with light sweet and an underlining semi sour note. Flavor is nice, clean and fresh. Nice wheat body surrounded by notes of citrus and banana. Light bodied mouthfeel, fresh yet slightly dry with med-high carbonation. Overall it's a very nice weisse bier. Light, fresh with nice notes and flavor. Not the best I've ever had but yet another beer I really like from Grand Teton. Nice balance and high drinkability. I recommend this well made weisse bier. a pretty good unfiltered wheat brew. pours very very light pale lemon color with a good two inch white head that leaves some delicate lacing on the glass. the nose is piquant yeasty and wheat malty. its light in body but big in flavor. plenty of citrus notes and spice from the yeast. coriander maybe in here? my only critique with the flavor is that it tastes a bit soapy, dishsoapy. leaves that flavor a little in the aftertaste, but its minor. the feel is good, light body and light abv, its an easy drinking summer beer. carbonation is about average. it went well with grilled asian ribs, and is one of the lightest, most citrusy weisse biers out there right now. not a miracle, but a useful and tasty beer form time to time. Appearance: Cloudy golden pour with a 1-finger head that settles very quickly and has poor retention and leaves virtually no lacing. Smell: A nice waft of wheat and yeast hit the nose. This beer smells crisp with a hint of spice and citrus as well. Taste: Plenty of wheat up front, some pine, and a bit of a citrusy taste as well. The finish is crisp and dry. Mouthfeel: Thin bodied but not watery, medium carbonation, and a crisp, refreshing finish. Overall: A pretty decent wheat beer that suits the palate and is nice and refreshing. Here is another one of Grand Teton's standard fares. Unlike their APA, this one is almost completely average. It's got all the components of a Hef - clove, banana, wheat, etc. but nothing extra or anything particularly memorable. Fans of the style might find more to appreciate. I, not being a particular fan of Hefs, will likely pass on this one next time. Poured 12 oz bottle into a Pilsner glass. Reviewed from notes. A- Clouded orange-yellow color. Ok carbonation. Two finger white head with weak retention. T- Light citrusy, wheat and something very sweet. Bubblegum? Very nice flavor. M- Medium bodied and weak carbonation. O- Decent hefeweizen. Would drink again. Flavor is definitely there, but the appearance is lacking. A good weizen should have a thick, fluffy head. This does not. Aroma and taste are spot on, taste(banana and bubblegum)is a little sweeter than the German native varieties A good effort, but a little ways to go. 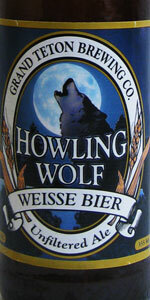 Howling Wolf Weisse Bier from Grand Teton Brewing Co.